The holiday’s are here and everyday at work people are bringing in all sorts of cookies and cakes that I keep indulging in! All of those bad indulgences make holiday weight gain almost inevitable so I’ve been trying to find healthier ‘treat’ alternatives to bring to parties and potlucks. Luckily I discovered a great company from Toronto called Shockingly Healthy Inc.
Shockingly Healthy Inc. was founded by holistic nutritionist and personal trainer, Lauren Breuer. The treats she makes allow you to indulge your sweet-tooth into decadent brownies and blondies that are nutritious, tasty, and vegan/gluten-free. Shocking right? Wait until I tell you what the magic ingredients are in these silky bars…Chickpea’s and dates!! I love that these bar’s are whole food based and that they don’t taste a thing like a chickpea. The texture is creamy and the taste is perfectly sweetened with the dates, cocoa, and coconut oil. It’s always a nice feeling when you don’t have to feel guilty about chowing down on a dessert. All natural, pronounceable, whole food ingredients! Lauren graciously brought me some of her treats which included the double chocolate brownie, coconut chocolate chip blondie and the holiday treat which was the minty double chocolate brownie. I was feeling generous so I split up the brownies in pieces and shared with the girls in my office. Everyone was in the PM ‘I need chocolate’ slump and so these treats were greatly appreciated. The feedback was VERY positive and shocking because we didn’t understand how these tasted so good yet were so healthy! Instead of feeling bloated and tired after eating sugar-filled treats, these gave me a boost of energy thanks to the high-fibre and source of protein packed in these bars. I was a sucker for the minty chocolate brownie and am already thinking about picking up another one soon. Please check her out on FB and Twitter and discover what healthy desserts are all about! 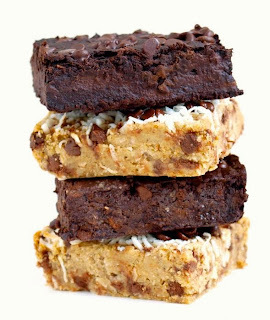 Healthy brownies! What a treat! Really chickpea? Date is a classic but chickpea is a surprise. They do sounds great and look tempting. Yum all the way--a bonus that they're healthy! This looks delicious and healthy, best of two worlds! I appreciate the ideas and this is very amazing material and have outstanding information. Thanks for talk about cookings.